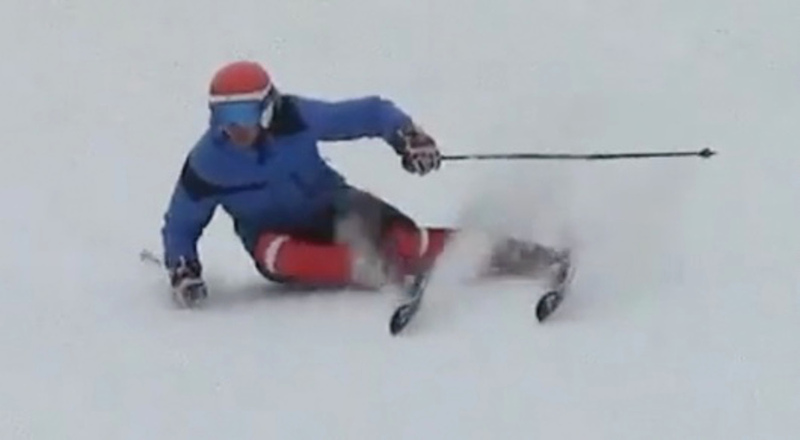 Sometimes referred to as Separation or counter, coiling or Counteraction is one of the critical ingredients of performance skiing and racing at the higher levels and also one of the less understood. Let's take a look at the detailed biomechanics of this movement in different situations, from beginner all the way to advanced. The simplest explanation of how to counteract is to rotate the hip around the top of the femur. 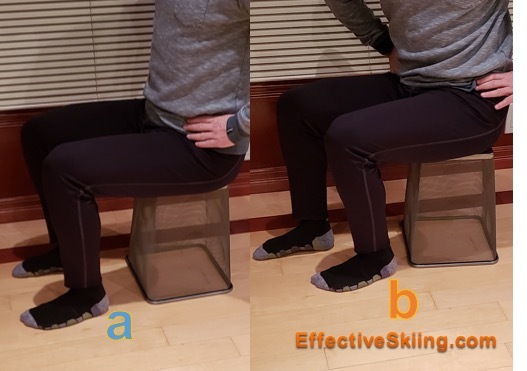 While some instructors and coaches may teach creating separation as a pivoting motion of the skis or twisting of the feet while keeping a stable upper body, the movement we are looking for, in high-performance skiing, is that of moving the hips instead. 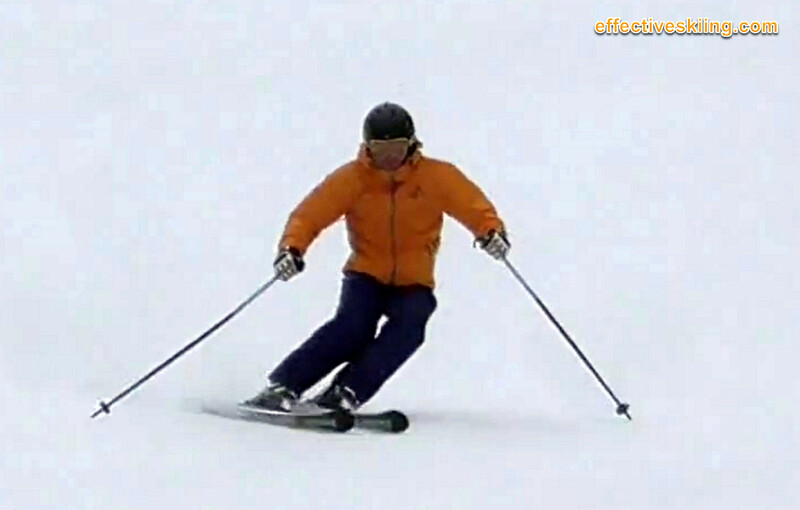 This different perspective becomes obvious once you think about the physics of an engaged ski: as opposed to a skidding ski, the leg is not forcefully turned by the skier anymore, the engaged ski turns the leg, so in order to maintain what appears like a stable upper body the skier must effectively turn the upper body the other way, to counteract the turning of the ski. In the photo above, you see the separation created by rotating the hip on top of the left femur (the left leg would be the outside leg). This simulates very well a carving situation, where the ski is engaged in the snow and cannot skid, so no pivoting is possible. The only thing one can do to create counter is to rotate the hip instead, i.e. counteraction. Read Femur rotation for more details. Beginners that counter will most likely start to counter with the shoulders because we are not used to rotating the hips - unless you're into dancing etc. However, twisting and putting the spine under stress is not that good, this movement should really be about rotating the hips around the femurs, that's a set of strong muscles and a good range of motion. Also, including the hips in this will allow us to counter not just half of the upper body, but with the big mass which is around the hips. Member-only content avilable (120 words). The example above, where you counteract by rotating the hip in the hip socket, really only applies when the leg is long. As soon as the leg flexes, the angle of the femur changes and the mechanics change with it. At the extreme case, of full flexion, where the knee is at 90 degrees (like sitting on a chair) you can no longer rotate the hips in the hip socket, to produce the same result. At this point, the movement becomes simply moving the inside hip forward, whatever it takes... and what it takes is shuffling the inside leg forward (or dorsiflexing the ankle), but for sure that inside knee moves forward. We've said the better version of counter is one where you also pull the inside foot back - limited by the stiffness and the angle of the boot cuff, but the effort is what matters. This creates an issue, for someone that starts with a lot of counter on a longer leg (like in the first set of photos) and ends the turn with a lot of flexion, like in the set of photos above. 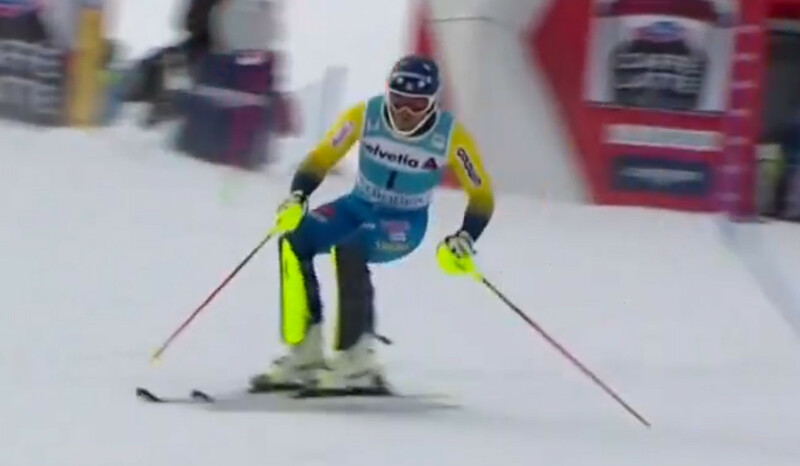 If at the same time, this skier insissts on keeping the boots even (pulling hard the inside boot back) this will square up the hips and undo the counter. 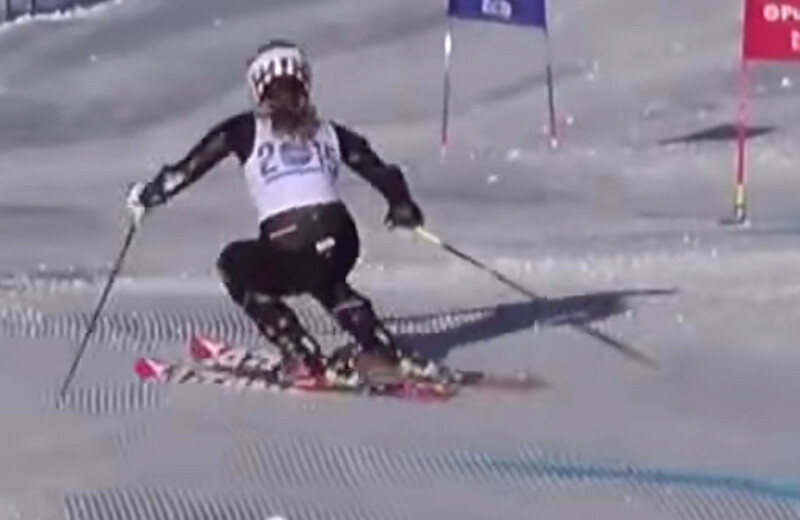 This is typical in high-performance skiing and this takes a lot of practice to get the hang of it and not square up in transition. Play with the different leg lengths and shuffling versus pulling the inside heel back. 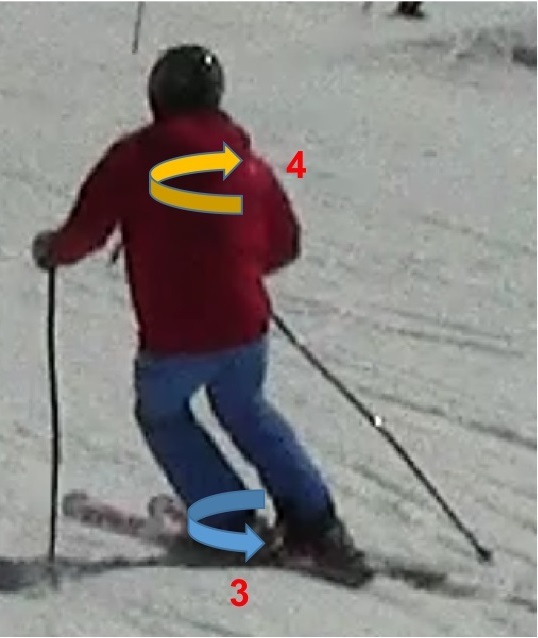 Some people create counter at the top of the turn and towards the bottom of the turn but then lose all the counteraction in transition because they flex a lot and insist on keeping the boots parallel - this, as we've seen above, will make it much harder to keep the counter and will unwind most of the counter created. The biggest issue with counteraction is the boot cuffs and it takes some experimentation to figure out how these details affect your movements and your skiing. Member-only content avilable (170 words). Work on the counteraction with the Coiling workout session. Viewed 609 times ( | Print ) this page.